Edith was the sister of William Lennon ,founder of Wm Lennon & Co Ltd bootmakers in Stoney Middleton. This is an account of her life after leaving England for America written by her great niece. When my mother Charlotte (youngest daughter of William Lennon) died at the age of 103 in 2011, I had the duty of sorting her effects, and what I have unearthed from her possessions, lay amongst them was an envelope marked “Letters from Maggie to Dad”. On opening, I found correspondence dating back to 1904 between the two siblings. This was a huge surprise as the family thought she had been killed in the Mexican Rebellion, but this had taken place before the dates on the letters. Previously I had told how Maggie had been adopted by the Holt family and taken to America. Somehow, Maggie’s Aunt Elizabeth had found out that the Holts were emigrating to America and taking her with them, so thought Maggie’s sister Lily should see her before they set sail from Liverpool. Maggie would be about 12 at this time, and when the sisters met, having been apart for years, they vowed to keep in touch and write to one another and also with my grandfather William. The letters I found describe the very strong bond between orphaned siblings. They are not only a very moving account of their attempts to keep in touch with each other from the other side of the world, but also because they are the actual means by which this was done they convey the emotions of the writer in a way that cannot leave the reader detached from the sadness being experienced. Maggie makes a lot of reference to photographs because her memory of William is fading, and at one point when she is grieving after the death of her adoptive mother says “I don’t know if I would know you my dear brother” . Ultimately, with the passage of time, and without any other form of contact their attempts to retain their sibling ties were bound to fail. At some point, probably at the time of Maggie’s marriage to Joe, they are let go. In her last letter she refers to herself as Miss Maggie HOLT all previous she referred to herself as LENNON. This may have been convenient for her to appear of Mormon Ancestry due to the way the Mormons (LOS) baptise their ancestors. Since finding the letters, with the co-operation of Percy Lennon’s grandson, Jeremy Lowe and the wonders of the internet, I have traced Maggie’s life back to her marriage, children and finally her death and resting place. 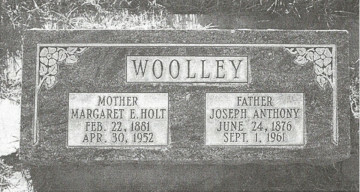 Maggie (Margaret Edith Holt married Joseph Anthony Woolley at LDS Temple in St. George, Utah. Joseph’s father Edwin Dilworth Woolley Jnr. was (Justice of the Peace, Sheriff of Washington County Utah. 1878. Served in Black Hawk War, 1865, Constable of St. George, President of Kanab, Utah stake 1884-1910. Prominent member of church of LOS (Mormon) Josephs mother was Emma Geneva Bentley. All have passed away – the last one Anna 2006. Maggie has many grandchildren and great grandchildren who are still living in Utah and Arizona. Maggie died in 1952 and is buried in Kanab City Cemetery along with her husband Joseph. The letters below are extracts taken from the original correspondence sent by Maggie to her brother William. Had my mother Charlotte realised the dates on the letters proved Maggie may still have been alive, efforts would have been made by the family to find out. She may not have even read them, as she never spoke of their existence during her lifetime, that we will never know! Compiled by Janet A. Gilbert (nee Morton) daughter of Charlotte Morton (nee Lennon) and granddaughter of William Anthony Lennon 02 Feb. 2015. They have done. I was glad to hear that you was married (approx 1895) and that you have such a good wife. I only hope some day we may meet again and will see each other face to face. Well my dear brother I don’t know what else to tell you Mexico is where lots of Mexicans live. Their is quite a few white people living here. Here where I live is about 700 people. So you might see it is not a very big place. Their is other settlements around, but this place is the largest. We have beautiful weather here. Today is like spring …..
Casket was covered with the most beautiful flower from her many friends. The people were very kind to us they would come and do all in their power to do. But nothing would save her. She went without a struggle. Oh dear Bro & Sister it is hard to bear up at times But I must not murmur for I have always had an easy life so far. But this is the greatest trial I have ever had to pass through. For my own earthly mother I do not know. (Refers to natural mother) I don’t know whether I would know you my dear brother. Well dear brother I will change the subject. I received the papers you sent me , I read it with great interest & thanks for it …. This trouble the best I can although I don’t believe it will ever be erased from my mind. I will send you a photo of myself as soon as I can get some. But there is no-one here yet that can take pictures. I am sure (Stoney Middleton) is a very pretty village Father Holt says he can remember it as well. I am sure the park you speak about is very beautiful I have never seen a park like that all that I have seen has just covered about a block. I would be more than pleased to received some views of your country. Well dear brother I guess you must have all the snow and we have all the wind. Today the wind is blowing very hard here in the spring it blows ….. Very hard for three months, their is hardly a day passes but what it blows, tell your little lily I would like to see her very much. I supposed she is getting quite a little lady by now I would like to send her something if i could but it is such a very bad country to get anything out if it was in the United States I could get her so many little thing. I suppose Percy & Arthur are getting a nice boys by this time. Well dear brother I must close for this time hopeing to hear from you again I hope you are all well as this leaves us the same. Give my best love & wishes to you Dear wife. So no more for this time. I now take time to answer your most kind and welcome letter which I received some time ago you must pardon me for not answering it sooner I have been very busy getting ready to leave since father died, I did not write and tell about it but I wrote to Lily and I thought that maybe she would write and tell you. But poor father died on the 28 of nov after a great deal of suffering. He went to EI Paso to the Hospital and had an operation performed upon his eyes and after a few days from then he met with an accident he happened to put up his hand to his eye and smashed his eyeball and it all run out on his face, of course after that he lost his eyesight. And I used to feed him with a teaspoon poor man. He just used to pray for death to come and release him of his suffering & he died like anyone going to sleep he never made a struggle. Well dear brother I was pleased to hear that you had received my photo, I was beginning to think that you had not got it as, your letter was delayed in coming. Bro Dear Willie they do not finish pictures here in Mexico like they do in other countries. You must have little Maggies picture & send it to me. I do wish I could see the dear little thing and everyone of you. Tell Charlotte I have got my dress made and I will send her a piece of it, it looks lovely and when I go to Salt Lake I will have my picture taken in it and send you one. I wrote and told Joe about me and who I was in my last letter, but have not heard from him since, I expect a letter next mail. Well dear Willie last Monday was my birthday, and when the young folks heard about it, two boys got a lot of girls together and got the girls to help them get up a party on me, the boys said now girls it is Maggies birthday and she is not going to have a party so let us get up a surprise on her and sure enough they did, they all brought picnic with them and came about eight o’clock at night. Well dear Willie I sure was surprised but we had a lovely time that night. to write for so long I have put it off until the last minute & have not got much more time to write but excuse me this time & will try to do better next time so goodbye love to all your dear family.